Interesting in the map that the Upper Peninsula of MICHIGAN is connected to Wisconsin. Happens often enough. Caught that as well that the UP is connected to WI. Also interesting is that WI is listed as being legal to use them for hunting? Yes we can legally own them and I’ve had one before and in the process of getting another but the last I looked in the DNR regulation handbook it is not allowed to use Suppressors for hunting. At least deer hunting. I’ll have to check that again. 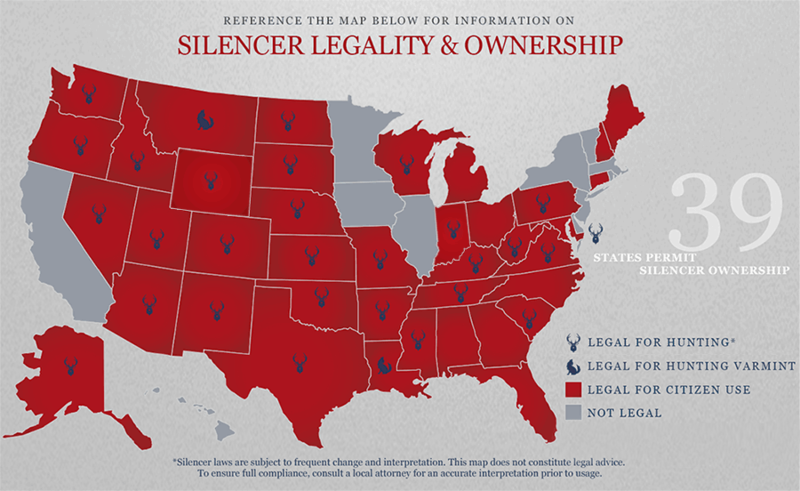 Why does it seem like no one knows ,it’s legal to own and to use for hunting in Minnesota,a sound suppressor. What was the first state to allow silencers for hunting?